(CHICAGO, NOI.org) - In the Name of Allah, the Beneficent, the Merciful. We give Him praise and thanks for His Guidance and His Blessings to the human family. The greatest of His Mercies and Blessings comes through His raising of prophets and messengers and sending to us Divine Revelation through scripture. So we thank Allah (God) for Moses and the Torah. We thank Him for Jesus and the Gospel. We thank Him for Muhammad and the Qur’an. Peace be upon these worthy servants of Almighty God. I am a student of the Most Honorable Elijah Muhammad, and I could never thank Allah (God) enough for raising this man up among us to lead, teach, and guide us to the Straight Path of God. I greet all of you, my dear brothers and sisters, distinguished guests who are present, those watching by satellite in the various cities of America by Internet and by satellite throughout the world. Words are inadequate to express the pain, the sadness, the anguish that has moved my spirit to come before you today to speak from my heart to your hearts, and beyond this room to the hearts of a nation grieved, angry, and in mourning. And beyond this nation to the nations of the world who have been and will be affected by this tragedy that has come to the United States of America. I, like millions of people around this earth, watched in amazement, shock, and horror, the events of September 11, and the unfolding of the ripple effect of this terrible tragedy. I have listened with great care to the leaders of this nation, political and spiritual. I have read the condolences of leaders from around the world who stand with the United States of America in this hour of her greatest national tragedy. I have listened and watched the President of the United States with his eyes filled with tears, feeling the pain of the countless numbers of Americans affected by the tragedy of events on the morning of September 11. I, on behalf of all the members of the Nation of Islam and on behalf of many millions of Muslims here in America and throughout the world, lift our voices to condemn this vicious and atrocious attack on the United States. In this very dark hour in American and world history, the greatest need for us and for the leadership of this nation is Divine Guidance. In the beginning of this creation, there was nothing but darkness. But out of darkness, God Created light. And Almighty God Makes Us bear witness to the creation of our universe out of darkness by causing each one of us to come from the darkness of our mothers’ wombs, out to the marvelous light of His Creation. This is to teach us that, no matter how dark the hour may be, in the midst of that darkness, there is light. And no matter how much despair there may be, in the midst of that despair is a ray of hope. The Qur’an says that Allah brings the living from the dead and the dead from the living, for wherever there is death, there is also life. And in the midst of life, there is also death. We mourn the loss of the many who have perished in this national and international tragedy. We commend the firemen and the policemen and women who risk their lives on a daily basis to keep an ordered society and a society free from the danger of fire and crime. These police and fire persons should be looked upon as heroes, notwithstanding the fact that we have issues of police brutality and racial profiling. Yet, it must be understood that these police and fire persons leave their homes everyday to do their duty in an ever-increasingly violent society, never knowing whether they shall return home to their families. There is a verse in the Qur’an that speaks of the courage of those who run to the fierceness of the center of the battle. These are the foremost men and women of great courage and valor. These firemen and women and these police men and women were running toward the fierceness of the flaming fire of the World Trade Center as many were running from it. Their courage, their valor, their sense of duty caused them to run into that building, not caring for their lives, but for the lives of those whom they were intent on saving. Unfortunately, many of their lives were lost in the process of this noble effort. The loss of nearly 300 firemen and nearly 100 policemen is not easy to replace, but I am confident that New York will rebuild. We commend Mayor Rudolph Giuliani and Governor George Pataki and all the city and state agencies that worked so well to minimize the effect of this tragedy, not only in New York City but in the nation’s capital, Washington D.C. The doctors, the nurses, the hospital personnel, the rescue teams and workers, and the many people who gave blood and did whatever they could to ease the pain created by this tragedy have shown the true spirit of the human being. Tragic events like this manifest the worst and the best in the human spirit. Our thanks to the news media, who worked through the night and day to bring to us the horror of this tragedy and to share with America and the world the pain and the hurt of those who lost their loved ones. Tragedy, however, can be turned into triumph. Sometimes, a wise, loving, and merciful God permits tragedy in our lives to encourage us to turn tragedy into triumph. Since the election of President Bush, this country has been deeply divided. The Congress has been deeply divided, and no amount of political skill or political money could unite America behind its President, but tragedy did. No amount of political skill could unite the Democrats and the Republicans, but tragedy did. No amount of preaching by all of us who preach could make the many diverse elements of society come together as brothers and sisters in a unified expression, but tragedy did. All of our preaching of the value of prayer and our preaching against the things that God forbids could not stop us from doing these things, but tragedy stopped us in our tracks and caused us to reflect on God and tragedy caused the nation to bow down and pray. The Scripture says, "If my people, which are called by my name, will humble themselves and pray and seek my face and turn from their wicked ways, then will I hear from heaven and forgive their sin and will heal their land." How then shall we look at such a tragedy? The question was asked, "Where was God in this tragedy? How could God permit such an evil thing?" There is a verse in the Qur’an that reads, "Whenever misfortune befalls the Believer, the Believer says, God is my patron and to Him is my eventual return." All of our lives are from God, and all of our lives are for His Purposes. He says in the Qur’an, "I Give life, and I Am the ultimate cause of death." He also says in the Qur’an that no soul dies but by His permission. Why did He permit such a tragedy? Even though the male carries the sperm and the female the egg and from our uniting, human life is formed. yet, Allah (God) said, not mother, not father, created you, but I created you in the womb. So He who gives life has the sovereign right to call life back to Himself as He pleases, when He pleases. The Reverend Doctor Billy Graham, in his sermon at the National Cathedral on Friday, a day of prayer, remembrance, and mourning, said that many times, he has asked the question, "Why does God permit evil?" He spoke of the mystery of iniquity, written of in Second Thessalonians and in the same sermon, although he said he has never answered that question fully to his satisfaction, he partially answered it when he thanked President Bush for calling for a national day of prayer, remembrance, and mourning. Dr. Graham said that this nation is in need of spiritual renewal and revival, and tragedy has brought us to the beginning of that process. Why does God permit evil? Where was God in this tragedy? In the Qur’an, there is an answer to this. Whenever a nation becomes great and powerful by God’s Permission, as America has; whenever a nation becomes the undisputed ruler of the world, as America has, by Allah’s Permission; when a nation becomes the only remaining superpower, having the power to destroy other nations and people by the tens of thousands and millions, as Allah has permitted America the power to do, and that nation then has a spiritual lapse and begins to sink into moral decline, the Qur’an teaches that Allah (God) raises a messenger, but he raises that messenger from among the poor and the abject to guide and to warn the great and the powerful. Allah (God) knows that the powerful will not heed a warning coming from their ex-slave or from the weak or from the abject, so the Qur’an teaches that Allah (God) then seizes that nation with distress and affliction, that it might humble itself. For only in humility can the proud and the powerful heed the Guidance of God, which is mercy and grace from Himself. Allah (God) used this tragedy, hopefully, to bring a great nation to Himself. I was born in this country in New York City, and though the pain that Black people have suffered in America has caused me to be angry with the country of my birth, however, in my maturation, I know that, with all of America’s problems, she’s the greatest nation on this earth. And in spite of America’s problems, America has the potential to become the greatest nation ever. As a citizen of this nation, I do not wish to see harm come to her, so, I must lift up my voice and cry out, not just as one crying in the wilderness, but as one out of love who wants to see this nation avoid the pitfalls that have destroyed the great nations of the past. Tragedy was turned into triumph. Tragedy began the spiritual awakening of a great nation and steeled its resolve to overcome the wickedness of those who perpetrated this assault on the United States of America. It took tragedy to bring about what all of our preaching could not do. So even out of the worst evil can come the greatest good. This hour, however, is producing the greatest challenge that this nation and this present world has had to face. This tragedy and the anger that it has produced in the leadership and the people of America has produced for this nation and the world in which we live a trial of huge proportions. In an hour such as this, we need the perfect and unequalled Guidance of God. In the Book of Proverbs, it reads, "And lean not on thine own understanding, but in all thy ways, acknowledge Him, and He will direct thy path." This terrible tragedy must have an appropriate response by the government and the people of America. The perpetrators of this crime turned the symbol of the nation’s aviation and technological brilliance of the 767 and 757 Boeing aircraft into missiles and messengers of death and destruction. The perpetrators of this crime used American and United Airlines, that symbolize the greatness of America’s mastery of the air, to make these airplanes messengers of death. The perpetrators of this crime destroyed a national symbol of this nation’s financial strength and architectural genius. The perpetrators of this crime struck at the Pentagon, the symbol of the military might of this nation, and that fourth plane that crashed in Pennsylvania may have been heading for the White House or the United States Congress, the symbol of our nation’s executive power and prestige and the symbol of the great laws that are made to govern a great nation. But by attacking the symbol of our nation’s economic pride and military pride, indeed, this was an act of war. So the leadership of America and the people of America are justifiably angry, but anger is a blinding emotion that can impede the process of reasoning. Pride also is a blinding characteristic. The Bible teaches that pride goeth before destruction and a haughty spirit before a fall. We agree with President Bush that there must be an appropriate response to this wicked attack, but anger and wounded pride should not and must not determine what that appropriate response should be. I saw on ABC television, Peter Jennings addressing little children and young adults, and they were raising very good questions and giving very interesting answers and statements, but one of the most important questions that I heard from the children and from the lips of the American people was, "Why do these people hate us so?" President Bush answered, saying, they hate us because we’re the beacon light of freedom. They hate us because we’re good. They hate us because we are the land of opportunity. And others say they hate us because they envy us because of the way we live and the wealth that we have. Pastors and preachers and Reverend Franklin Graham said that they hate us because we’re Christians and they want us all to be Muslims. With all due respect to our President and to these esteemed religious leaders, that is not the best answer to that question. I can speak on behalf of Muslims, and I must say that no Muslim hates a Christian because he’s a Christian and believes in Jesus Christ. This is a mosque, and there are thousands of mosques in America and millions of mosques across the globe. There are 1,250,000,000 (one billion two hundred and fifty million) Muslims, and every one of us believe in Jesus. This book Qur’an refers to Jesus in the same language that Christians refer to him as Jesus the son of Mary, the Messiah. To say we hate Christians because you’re Christians is wrong. These are, at best, surface answers to what produced this tragedy. If the perpetrators hated us because we’re Christians, they did not kill just Christians. According to the figures that I heard, 1,400 Muslims work in the World Trade Center and are missing or dead. The perpetrators killed Black and White, Asian and Hispanic, Jews and Christians, Agnostics, Hindus and Buddhists. This is why it was a crime against humanity. The wise of this world know that there is a law of cause and effect. Why are we angry today? Why are we mourning today? Why is America in the spirit that she’s in today? This is the effect, but the cause was on the 11th of September. But what is it that caused 19 so-called human beings to run planes into buildings, killing themselves and others, without a care for who they were killing—men, women, and children. Why do they hate America as they do? This is a valid question that demands from our president and our leaders a better answer. Those who perpetrated this horrendous act have lost their humanity and had become like wild beasts with only one thought in mind, to devour their prey. These persons, so depraved, only wanted to bring death and destruction because of their hatred for the United States of America. The Honorable Elijah Muhammad taught me that our universe is constructed on what the Qur’an calls the mizan, or a balance. That balance is justice. That is why the symbol of justice is a woman blindfolded with a scale in one hand and a sword in the other. Justice is what balances the human mind. Whenever any human being is deprived of justice, the mind becomes imbalanced. The greater the injustice, the greater the imbalance. In a democratic society and in a civilized nation, institutions are established for the redress of grievances, and it is the success of granting to those who seek the redress of their grievance and having it done that returns balance to the human mind. The Palestinians believe they have sustained injustice since 1948. Whether you agree or disagree, from their point of view, they have not had justice. They have cried out in every forum for the redress of their grievances and justice has not come. They live in refugee camps, are scattered throughout the world and every day they live with the horror of what they suffer. So more and more minds become imbalanced to the degree that life has no more meaning, for there is no joy in being free if there is no justice. Joy is the result of justice. Out of despair and hopelesness and waking up everyday without the joy of justice, this is what causes children to strap themselves with bombs. They care nothing for their lives, and they care nothing for the lives of others. They want others to feel the pain of what they live with everyday. Some Palestinians danced in the streets, not because they have no feeling for American life. They danced because they wanted America to feel what they feel, what they have lived with. They are only a tiny minority. The majority of the world grieved with us. We stand with President Bush, the government and the people of the United States, in their desire to hunt down those responsible for this heinous crime against humanity, but we caution the most powerful nation on this earth, that has the power to inflict pain on any nation beyond imagination, that counsel from the highest spiritual sources must be sought by President Bush and the administration before they undertake this war. The President of the United States has sat down with the Joint Chiefs of Staff, his National Security Advisors, and, indeed, a war has been planned and is being planned. While the President has sought counsel from his military advisors, I hope that he will seek counsel from spiritual men and women of this nation who have studied prophecy, especially those prophecies related to this time. I would humbly advise and implore the President of the United States that, before he takes this country into war to counsel with scriptural scientists who are among the Jews, the Christians, and the Muslims. There are those who have given their lives to the study of prophecy and can advise him so that, as we put on the armor of battle, we will put on the whole armor of God, lest we lose. Mr. President, I plead with you that this war that you intend could trigger that war that all the scientists of religion and of war have desired to escape, the war that would end all wars, the War of Armageddon. The scriptures teach that, when you see Jerusalem surrounded by armies, this is a sign of the end of this present system of things. A horrible and escalating violence in the Middle East is a potential trigger of Armageddon; and this is why the world must be interested in peace in that area. But, there can be no peace in that area without justice and it seems as though the political people cannot bring it about, so those that are religious scientists must rise to the occasion. The children of Abraham—Muslims, Christians, and Jews—pooling the best of our knowledge of scripture, can help to solve that problem. We must be allowed to do it, lest it cause something that causes most of humanity to perish. This that happened on September 11 could be a trigger of a war that was predicted regarding this time. The scriptures warn us that when the horror of this war begins, that if God had not shortened these days for His Elect’s sake, no soul would be left alive on the Earth. This is what we face. We cannot march off into war saying, "Hip, Hip, Hooray." We have to march off into war guided by the knowledge of what this is, and if we can avert war, we should do everything we can to avert it because,"Blessed are the peacemakers for they shall be called the children of God." I would appeal to the scriptural scientists among us, those of Judaism, Christianity and Islam, to be utilized by President Bush to help him understand this hour from what the prophets saw and predicted. There are some prophecies that can be beaten, and there are some mitigating circumstances that can even remove, delay, or postpone the horror of Judgment. But, this will demand guidance from God, and it will depend on the choices that we make. Our hearts, in an hour like this, must be humble enough that, through our tears and anger and extraordinary pain, that we reach for the unequalled Guidance of God. America as a beacon light of freedom has called many nationalities, many races, many ethnic groups to these shores. Among these are Arabs and Asians, many of whom are Muslims who have come to this country, not to destroy it, but they’ve come to this country and they rejoice in the freedom that they enjoy to use their skills to make a better life for themselves and their children. They build their mosques and schools so that they can keep in touch with their religion and their culture, not to destroy America’s culture and her way of life. Most of these immigrant Muslims came to serve America, and you can find them in hospitals, in colleges, in universities, in research laboratories, and they are aiding in all aspects of American technology and scientific progress. Surely they love the countries of their birth, but they greatly love their adopted country, the United States of America. Though some of these perpetrators of this horrible crime may claim to be Muslims and are people that speak Arabic, the American people should not attack these good citizens and destroy their mosques or beat and harass them simply because of the evil that has been done by those who may profess the religion of Islam. This would only make you like the perpetrators of this crime, who attack the innocent because of their anger and their hatred. 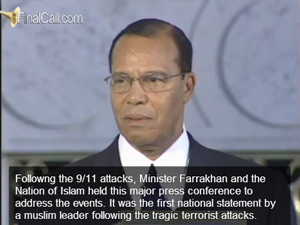 When Timothy McVeigh committed the worst act of terrorism on American soil, the first persons accused of this were members of the Nation of Islam and immigrant Muslims. Many followers of Islam were attacked, and then it was found that the perpetrator of this crime was a White American, a soldier who professed to be a Christian. But no Christian of his denomination was attacked. Even though his crime was the most horrible committed up until that time, nobody said "Christian Timothy McVeigh." They just said, "Timothy McVeigh." Timothy McVeigh’s behavior was un-Christian-like, and, those who perpetrated this crime against America, their conduct was absolutely un-Muslim-like. In the Holy Qur’an, God teaches us, "Let not hatred of a people incite you to act unjustly." While this is good counsel from God for the Muslims, it is also good counsel for Christians and Jews and the President of the United States of America and the American people. The Qur’an admits that some of us will be hateful of others, but Allah demands that we let not hatred of any people cause us to act unjustly. The hatred that deprived these human beings of their sanity and their humanity is based on something far deeper. I heard Colin Powell, our Secretary of State, say that we’re going to rip up these cells of terrorism and we will seek them out and hunt them down wherever they’re found; and I heard a female general, General Kennedy, on television say yesterday, "we’re not interested in capturing Osama bin Laden and taking this through any court. We want the head of this viper and all of those who are like him." These people are talking about violating international law, violating any law that will impede them from their pursuit. If Osama bin Laden were presented to the American people on a slab, this would not suffice the blood lust that this terrible tragedy has unleashed in America. As our Secretary of State said that we will rip up these nests of terrorists, I appeal to the President and I appeal to the Secretary of State to take the courage to look at the foreign policy of our nation. If it is our foreign policy that has produced this danger and hatred toward America, as you go into such a war, we have to ask ourselves, what have we done to produce this? Not the American people, not the soldiers that are in the armed forces of America, but what have the policy makers of this country done to produce this? I have gone all over this world preaching atonement, reconciliation, and responsibility, and into every nation into which I have gone, I have not found people hating the people of America. Whenever they speak disparagingly of this country, they speak of America’s foreign policy, policies that are made that the American people know nothing about. I sincerely hope and I pray that the policymakers of this nation, who have made policy based on corporate greed, I would hope that this terrible tragedy would cause the policy makers of our nation to look again at how we formulate foreign policy. There are two golden rules, one in Christianity and one in Islam. The golden rule of Christianity is, "do unto others as you would have others do unto you." As a Christian nation, this golden rule should be at the core of our policies, domestic and foreign. But is it? As Muslims, we are told that we are not Muslims or we cannot be considered righteous until "we want for our brother what we want for ourselves." These are the rules that should guide policy. A better foreign policy of America would defeat terrorism forever in the world. I hope that President Bush and those with him will turn this tragedy into the triumph of right over wrong, of good over evil, of justice over injustice, and let not the blood of those who died be shed in vain. Beloved people of America, there is nothing of consequence that is not attained by the shedding of blood. That same World Trade Center, many workmen died building it. Every bridge in New York that connects the boroughs to each other, someone died to build those bridges. Every tunnel in America, someone died to build that tunnel. Death must serve the cause of life, freedom, justice, equality and righteousness. Let this terrible tragedy lead to a rebuilding of spiritual values that connect the children of Abraham—Muslim, Christian, and Jew—in a rebirth of moral and spiritual values that could lead to the making of a new world, a world that ultimately will beat swords into plowshares and spears into pruning hooks, not just for the cultivation of the earth, but for the cultivation of every living human being on this earth, so that never again will men be so depraved that they will do what was done on September 11, 2001. May God bless the citizens of America. May God guide the leadership of America in this very dark and troubling hour, as I greet you with peace, As Salaam Alaikum (Peace Be Unto You). Brothers and Sisters, that ends my statement, but now, with the Help of God, I will open myself up for questions from the members of the media. If you will state your affiliation and your question, I will do my best to answer it for you, Insha’Allah (God willing). I’m Lea Hope with ABC 7 News. Minister Farrakhan, you talked about offering your help, or that leaders of this nation should get advice from religious leaders. Do you hope that President Bush will do that, or have you been in touch with him? Yes, I hope that. I will write to President Bush. I’m not asking him to use me, although I think I could be of use, but I do know that, among the Jewish people there are scholars that have decoded the Torah, who know these prophecies. They could be very helpful to him. And among the Christians, there are many scholars that have studied the prophecies relating to this hour. I would hope that he would call them quietly around himself that they might give him guidance. The Pope knows these prophecies. I hope he will seek counsel from the Pope. Whoever he can seek good counsel from on the spiritual level, I would hope that he would do that. That’s part of his armor. And is there anything that you are offering as far as Muslims in the Nation of Islam and Muslims across the country? Is there anything that you are suggesting that they do? As a Muslim, the greatest thing that we could do right now is to pray, because it appears that this war may take American soldiers into Muslim countries, and it may cause the death of many, many innocent Muslims. This is what we would hope could be avoided. My name is Jamal Abdul-Alim, reporter with the Milwaukee Journal Sentinel. As the military leaders have discussed their plan of action, they talked about building an international coalition to fight terrorism. My question to you is, as one who has traveled abroad to many countries throughout the world, what advice do you have to the leaders of those nations as America approaches them for assistance in rooting out terrorism? Thank you. If you didn’t hear his question, he said, what advice do you offer the nations that America will approach to assist her in this war against terrorism. When the Cuban Missile Crisis touched America and the Kennedy Administration, they flew spy flights over Cuba and had pictures that were irrefutable that there was indeed a missile build-up 90 miles from America. And at the appropriate time, at the United Nations, the American ambassador presented this evidence. According to what I heard on television, there’s overwhelming evidence that Osama bin Laden is responsible for this. As a Muslim, it reads in the Qur’an as guidance for us: "Whenever an unrighteous person brings you news, look carefully into it lest you harm a people in ignorance, then be sorry for what you did." I remember President Johnson made the war in Vietnam the centerpiece of his administration and a great lie was told, that the Congress produced the Tonkin Gulf Resolution that led to 500,000 American soldiers being sent to Vietnam. It’s unfortunate that one of the first casualties in war is the truth. I would say that this overwhelming evidence should be put before the leaders of the world before it is allowed that their countries be landing bases. I think that’s only proper. Produce the evidence and we back you up. But if it’s something that you have used as a predicate for something else, then maybe it would be wise for us to look carefully at the evidence. I’m Nathaniel Omar from The Muslim Journal newspaper. As Salaam Alaikum, Brother Imam. Brother Minister, what is the advice that you have for Muslims in America in this time, seeing that many people who have some identifying Muslim dress on are being attacked, these innocents are being hurt for no cause at all. So what would be your advice to Muslims in America at this time? I think that the anger will subside and the crisis will pass and the American people will begin to reason beyond the anger and the pain. Mayor Giuliani and even members of the news media counseled the American people against attacking American citizens who are Muslims, who dress in their own cultural garb. I believe that, as this anger subsides, reasoning will come back up, because we cannot reason in a climate of anger and hate. As that subsides, I believe the Muslims will be able to go about their daily duties as citizens and their daily duties as Muslims without fear. However, the attorney general, from what I heard today, is asking for new laws to combat terrorism. I don’t know what that means, but I hope it doesn’t mean ultimately a repeat of what happened in 1941, when Japanese Americans were herded into concentration camps or in the movie "The Siege," when Muslims were rounded up and put into concentration camps. All of these kinds of movies show Muslims as terrorists and whenever they hear "Allah U Akbar," God Is Great, they think it’s some fanatic cry of death and destruction. America really needs to learn more about the people that are in her midst. One of the things that happened as a result of Peter Jennings’ show with the children, there was a beautiful Christian minister and a Muslim Imam there that defended Islam so beautifully, and many of them said that, in this crisis, people have talked to each other that never talked to each other before, and got to learn more about what Islam really is and not what is presented. I think we have to try to escape agendas, agendas that may use the ignorance of the people as a weapon of destruction of persons and people that are not liked. I myself know who and what I am. I know I have never hated Jews. I’m critical of aspects of Jewish behavior in relationship to Black people. I’m critical of the government in aspects of their behavior toward Black people. It doesn’t mean I hate America. I’m critical. And because I have the freedom, because of that great constitutional guarantee, to speak even if people do not like what I say, it is the freedom to speak that guarantees America a greater future. When you stifle voices that may disagree with you, you’re only stifling something that could cause you to reason beyond your own bias, your prejudice, or your own views. I have been labeled as many terrible things. And, my God, if others are being labeled as I have been labeled, I cannot trust the labels. I have to look beyond the label to see who and what is beyond the label that even our government gives, because America has awesome power. She can call a nation a rogue state, and Congress will agree with that, but she does not invite the people from the rogue state to come before Congress and state their case so that we might be maybe more tolerant of a view different from our own. Just to label somebody a rogue and now go after them with the military might of America, I think something better has to be done. In fact, in a three-hour conversation I had with Syrian President Hafez Al-Assad before he died, he talked to me of a conversation that he had with President Bush, not the current president but the former president, and they were talking about terrorism. President Assad asked President Bush, let us get a definition for terrorism and a terrorist that can be universally accepted by the nations as a standard by which to judge a nation’s conduct and an individual’s conduct and based upon a standard, we go after those who fit that definition. I thought that that was a wise statement of the former President of Syria, and I think in this hour when the word "terrorism" is going all over the world, let us meet in the United Nations and form a definition for the term and then hold every nation, including this one, up to that standard. I will take two more questions. Maisha Hamilton Bennett, Chicago Defender. I wanted to ask a question. It seems that the President’s rating has gone up really high among the American people when he talks about war and that the same spiritual leadership that you’ve mentioned that needs to go to foreign policy makers, what do you think about, or do you think it’s possible to have some leadership exerted from the clergy to the people so that they will be demanding peace instead of demanding war? I think it eggs on what our government is doing, that the people are demanding war, not peace, and that maybe the spiritual leadership could help them look into their own Christianity … in terms of forgiveness and justice? Thank you very much. Very good question and a very good statement, sister Maisha. I have heard many pastors over this last five days, and there seems to be a common thread running through the pastors, whether they are Christian or Muslim or Jewish, and that, to me, is a good sign, a very healthy sign for the American people, I do believe that the spiritual leaders should rise at a time like this and not only give guidance to the government, but give guidance to the people. Yes. And, of course, the ratings of the president went from a dismal, something in the late 50s or early 60s, to 91 percent. And you ask, well, why is that? Because in an hour of national tragedy, the President stood firm. The President offered comfort. The President spoke to the anger of the people. So, they naturally support him. And I’ve seen this done. Whenever a leader of another country is labeled as a very ugly fellow, they take a poll, and if the poll suggests that the propaganda is working well, that influences policy. But I’ve also seen that as time goes on and more and more truth is exposed, those numbers go down. I believe the American people are fair if they only know the truth. If you tell the American people the truth, they will make the right decisions. So in an hour like this, that is understandable. But as time goes on, more and more of the American people will ask more and more questions. I’ve even seen on television among White former ambassadors and men and women of conscience who spoke against this, they cut them right off, because the commentators don’t want to hear anything that appears not to be an opposing view, but appears to be a view that challenges one to think a little better than we’re presently thinking. And that is why today I desired to go up on satellite, on Internet, to speak personally to the American people on behalf of myself and the Nation of Islam and Muslims. Although I cannot say I speak for all Muslims, I believe that what I have said today, most Muslims would agree that I spoke the truth from the teachings of the Prophet (Peace Be Upon Him) and from the teachings of the scripture for Christians that are here. I want to thank all of you for coming and I think it is only appropriate that we close this meeting with a prayer and those religious leaders and teachers that would like to come forward and join me, let us pray for peace and pray for justice and pray for this nation and our world. May God bless each and every one of you. Brothers and sisters, would you stand for prayer? Those standing with us are religious leaders of Christianity and Islam, and I’m honored by their presence. I want to thank the police, the authorities that are here representing the Superintendent. I want to thank the fire personnel that are here. Thank you. These are the real heroes, so if we would just bow our heads in prayer. A’udhu bi-llahi minash-shait ani-r-rajim. Bismillah Ir Rahman Ir Rahim. Alhamdulillahi Rabbiyal ‘alamin, Ir Rahman Ir Rahim. Malikki yaumidin. Iyya canabuddu wa iyya canastain. Ihdi nas siratal mustaquim. Siratallahdina anupta alahim. Guyreal mahdubbi alahim. Wala daullin. Amin. Could we all hold each other’s hands, please? O Allah, Lord of the Worlds, the Lord of Abraham, the Lord of Moses, the Lord of Jesus, the Lord of Muhammad and all of the prophets in between, the Lord of the Righteous, the Lord of the Worlds. We come to You in this dark hour of national tragedy, praying for Your Guidance and Your Comfort on all those who mourn and we ask You to give them the oil of joy for their mourning and beauty for the ashes that covered New York City. O, Allah, help our government officials to look at themselves and policies that may produce this kind of anger and hatred, and as terrorism is expunged from the face of the earth, let policies that lead to derangement and imbalance because of injustice also be ripped apart from the pages of the governments and kingdoms of the world. O Almighty God, help us in this hour to preach Your Word unadulterated to the people who seek your guidance. Help us to take courage in this hour, not to be muzzled, but to speak the truth and spare not and cry aloud. Even though we are a few today, but tomorrow we will be a chorus. Let there be no war. Let there be peace, but let there be justice, because only in the principle of justice will there ever be lasting peace. Guide our President and his administration and this government as they move forward, but help our President to see the need for his intervention in the Middle East with an even hand. Help our President to see that the people’s of the Earth that cry out for justice need the voice of strong America to lead, and if America will not lead in a moral and righteous way, then God says He will raise up another people who will love Him and will do His will. O, Allah, in this dark and tragic hour, unite our hearts in righteousness and goodness, and let the darkness of September 11 vanish by the light of goodness and mercy and truth coming from the lips and the hearts of your servants. Bless all those in New York who suffered through this. Bless the families who have lost their loved ones. Bless the people who weep over such a tragedy, a tragedy the likes of which has never touched American soil. Though we have seen on television the carnage in Europe, cities bombed to the ground, but rebuilt. We’ve seen carnage in Africa and Asia and in Central and South America that has been rebuilt. We can rebuild the World Trade Center, more beautiful than ever, with the names and the faces of those who died in her in the foundation of a new Trade Center, a new Pentagon, but a Pentagon armed with the might of right. Let this nation, with every race and every kindred and every tongue, be the cornerstone of the Kingdom of God. That is her destiny if she makes the right choices. And we pray in Your Holy and Righteous Name, invoking the name of all of Your prophets, that America will make the right choices in this great hour. We ask it all in Your Holy and Righteous Name. Amen.